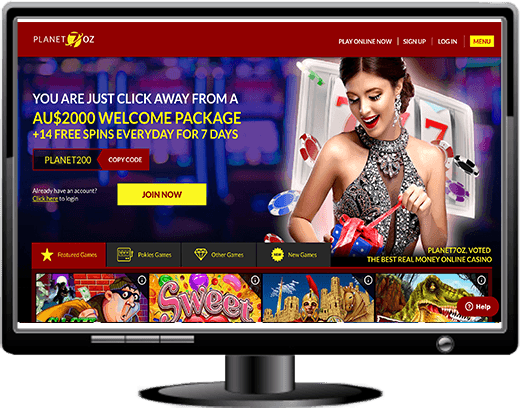 When you jump into Planet 7 Oz Casino, you’ll immediately see how different it is to most other casinos that we’ve reviewed. The reason for this is that the casino gives you the promotions and new game splash screens right up front! There aren’t any playable games on the home screen. We found that this was actually quite refreshing to see what’s on offer first without drawing people or luring people into the game offerings immediately. You’ll get two different modes of play with Planet 7 Oz, one of them being through the PC app and the other needing Adobe Flash player in order to play the instant games. The site is actually laid out really well and has all the right user experience you could ask for. Everything is up front and in your face and when you need to find something, you’re able to see it straight away. The front page is perhaps designed for mobile as it’s far easier to scroll to each new offering. Backed by Real Time Gaming (RTG) software, you’ll find access to a bunch of your favourite pokies and table games. This will include the likes of classic slots including 3-reel, 5-reel and 7-reel slots, classics and progressive jackpots. There is a nice variety of table games too, you’ll get to play baccarat, different types of blackjack and different types of poker too. If poker is something you’re keen on, then you’ll love the video poker section too where you can play a wide variety of video poker games. Finally, they have specialty games at Planet 7 Oz too. These will include a couple of roulette varieties, Craps, Keno and Banana Jones. For almost every single game that you find at Planet 7 Oz Casino, you’ll see two options where you can play for real money or practice. This is a great option because it will allow you to try a couple of new games or slots as you like. One thing that we did find was missing was some of the bigger progressive jackpot names and the absence of live casino games. RTG doesn’t normally include live casino games, so it would benefit Planet 7 to get on board with another provider. Planet 7 Oz Casino is a fully responsive mobile casino and offers almost every game that you can find on the casino in a mobile form. This is because the game has been adapted by RTG to make sure that it’s just as fantastic when played on mobile. They achieve this by adapting the game to mobile. In the day and age where everyone has a smartphone, it only makes good sense for an online casino provider to ensure that their site is not only mobile responsive, but each and every individual game functions well on mobile. Whether you have an older Android phone or a brand new iPhone, you’ll find that your smartphone or tablet device will work no matter what kind of game you decide to play. The games themselves have been constructed a little differently so you may find more bells and whistles on the desktop version but that’s purely to improve the experience of the mobile games rather than trying to take anything away from them. You may not find the cream of the crop in terms of big progressive jackpots out there in the casino world but you’ll find that there are six really good progressive jackpot games on offer at Planet 7 Oz Casino. You’ll be able to take Megasaur for a spin and if that’s not the kind of progressive for you, there’s also Seven Stripes, Coyote Cash, Rudolph’s Revenge, The Three Stooges and Jazz Time. There have been quite a few big winners with some of these slots over the last few months, so don’t think that you can’t instantly win the big bucks when you play one of these progressive jackpots! You can also join up with the VIP scheme at Planet 7 Oz where you’ll get a 300% bonus on pokies and keno only. Planet 7 Oz Casino has a great live chat support feature that functions 24 hours a day, 7 days a week. If you’re not able to contact the support team through that method, you can also get hold of them via telephone or through email. There’s also a dedicated VIP department to help and assist when needed. There’s also a great FAQ section that can be found at the bottom of the page where it’ll have a bunch of answers structured around deposits and payouts. If your questions and answers aren’t found in there, then give their friendly support team a buzz. The banking options that are listed at Planet 7 Oz Casino seem quite limiting and you’ll find that you can actually deposit using a few methods. Those include popular debit and credit cards VISA and MasterCard, and then through Bitcoin. They don’t mention it on the site but you’re also able to deposit using leading ewallets and pre-paid cards too. For withdrawals, you’ll be able to get real money back in your account through a bank wire transfer. This will deposit to any local account that you want, but it’ll take a bit of time. Finally you can also use cryptocurrency in the form of Bitcoin if you want to get your money sooner. As with many different bank wire transfers, it’s going to take anywhere between 3 and 7 days to get your money into your account. That’s not actually down to Planet 7 Oz, that’s down to the banks. Planet 7 Oz Casino will take around 48 hours to process the withdrawals on their side before they make the payment, so you can start counting the days from there. If you decide to go the route of Bitcoin, you can do so. This is obviously much quicker and reports have been made that people have received their winnings within a few short hours, so this is by far the fastest route to get the money in your account. Planet 7 Oz Casino is a nice place to play if you’re coming from Australia and want to spend AUD. In fact, it’s primarily aimed at Aussie players, so you’ll feel right at home. The deposit and withdrawal options are a bit limited, but you’re still catered to and you can always contact customer support to get a couple more additional options. The game selection is great and RTG pokies and games are always crowd pleasers. If you’re after some of the bigger progressive jackpot games and live casino titles, you’ll be a little disappointed, but there’s plenty to make up for it.